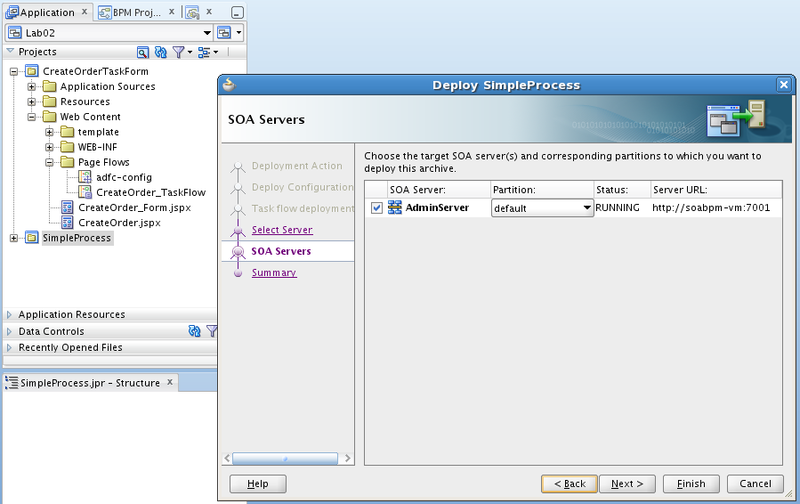 All this makes ADF part less dependent on SOA specifics, as well allows to minimize workload on SOA domain. 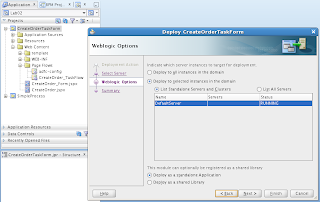 I was deploying CreateOrderTaskForm application first. 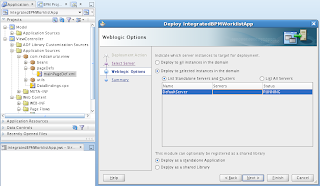 Follow this section from Oracle SOA/BPM developer guide: 30.8.4 How To Deploy a Task Form to a non-SOA Oracle WebLogic Server. While provided documentation info is very useful, still you can't follow it completely. Decide first, how you would like to run BPM Worklist TF. There are two options - federated and normal modes. Federated mode provides less functionality, is designed for remote servers. 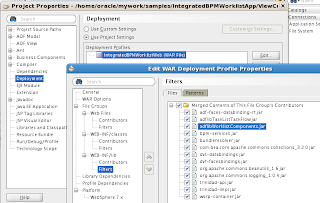 My sample app is configured (as by default) to run in normal mode, this means there is no need to create wf_client_config.xml file. 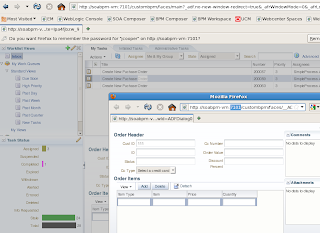 Assign BPM security grants in system-jazn-data.xml from non-SOA domain. You still will see security error, when starting non-SOA domain, it will try to register Human task form with BPM process and will fail - you can ignore this. 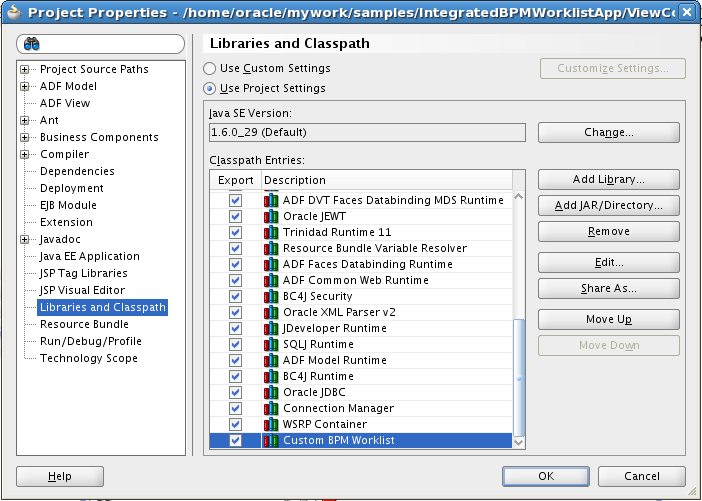 First part is completed - now we move to BPM Worklist TF (IntegratedBPMWorklistApp_v2 application). 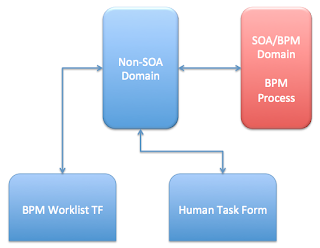 We are not using out of the box shell application - BPM Worklist. 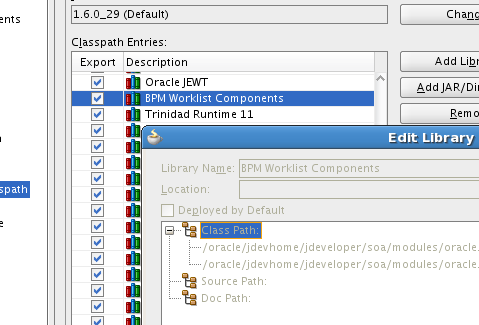 Instead we are using only Task List TF from that application, inside our own custom environment. 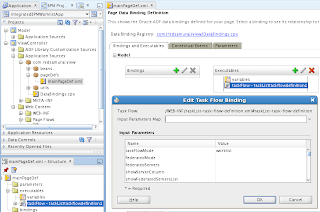 Read more from Oracle BPM developer guide - A Creating Custom ADF Applications with Oracle Business Process Management Workspace Task Flows. What if our composite application contains soa-mds connection ? 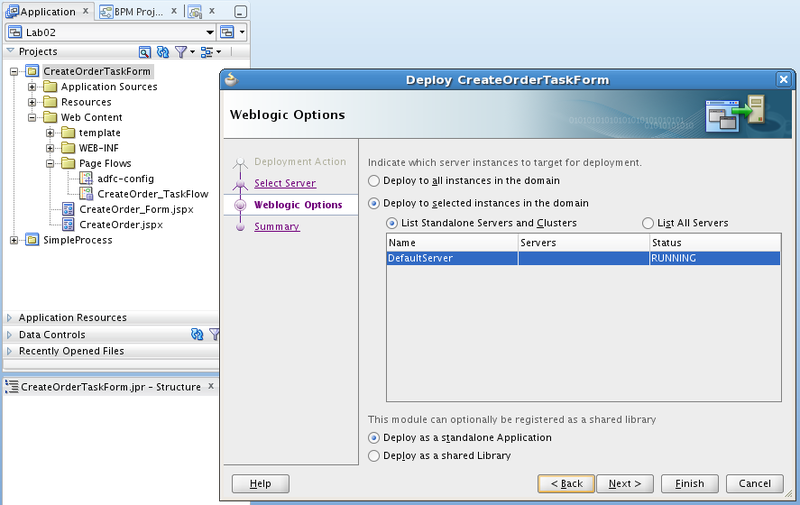 Should there be way to register SOA-MDS to IntegratedWebLogic ? Excellent post Andrejus. Makes the life so much more easier . Also, when do we look to run the taksflow in the fedrated mode as against normal mode as outlined in this blog. Also, if you can share something on the fedrated mode it would be great. When I try to implement the task form to run in non soa domain . I keep getting classcast exception intermittently. Once I start the soa and the non soa server the error seems to go away. But it seems to happen quite frequently. Thanks for the update Andrejus. One more question .. reagarding the foreign jndi. 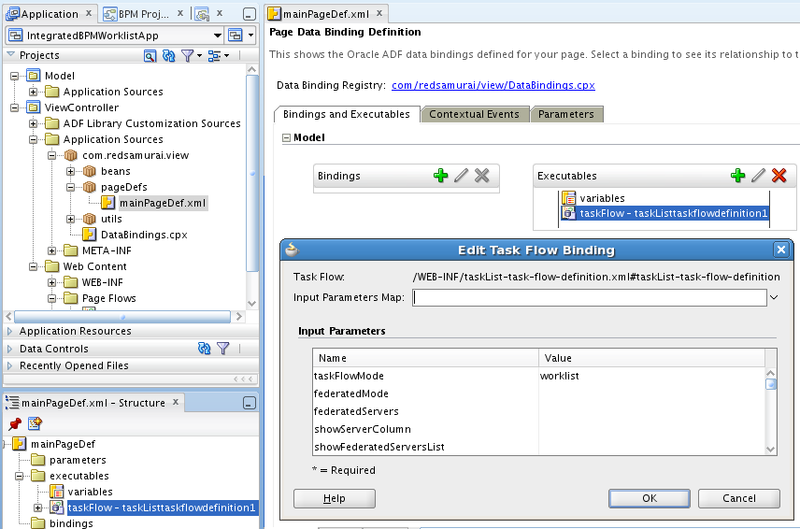 It seems as per the documentaion we need to configure only 8 links http://docs.oracle.com/cd/E23943_01/dev.1111/e10224/bp_designtf.htm#autoId33 . But somehow in the screenshot you have attached there are 14 links. I ask this because I am getting an exception when I try to claim the task inside task form deployed in non-soa(or take any action). The exception is unable to lookup the jndi ejb/bpel/services/workflow/TaskServiceGlobalTransactionBean. This jndi something I had not configure as it was not mentioned in the doc. But I can see from the screenshot that it is configured for you . Once I create this jndi link the error goes away. Can you please guide on the jndi we should be creating for the task form to work correctly. Yes, as I remember now - docs were incomplete. Its why after some research and comparing JNDI on SOA domain I included these additional JNDI. Can you please let me know how to get rid of this error? I could resolve this error just be changing the sequence of starting the servers. Thanks to John Schleicher who suggested me below sequence. 3. After IPM & UCM started, start SOA. Check if this resolves your problem. 1. 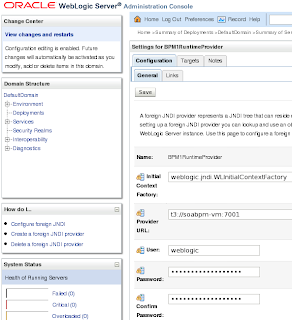 Stop WebCenter Content: Imaging Server. 3. 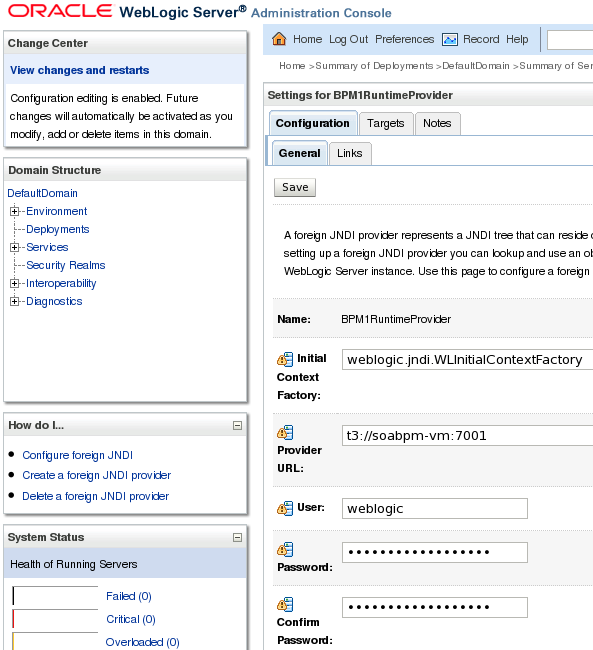 Restart WebCenter Content: Imaging. But above solution worked for me. Let me know if it works for you toooooooooooo. When i try to run this application _afrLoop goes into infinite loop. I am also getting class cast exception. I tried restarting servers as said by Achinto and Vikrant but no luck. 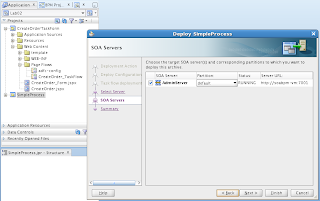 I am using Jdev integrated server as non soa server and standalone soa server. You are doing something wrong guys really :) I just was running the same app today without issues. You can achieve this requirement by customizing rewriting document support in Human Task with RIDC UCM API and setting your custom UCM metadata field. 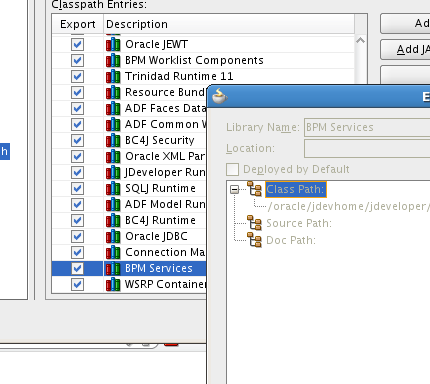 My system-jazn-data.xml is the same as per oracle bpm developer guide. Thanks Andrejus for the reply. Finally it is working. Looks like Both non soa and soa weblogics should be of same version. 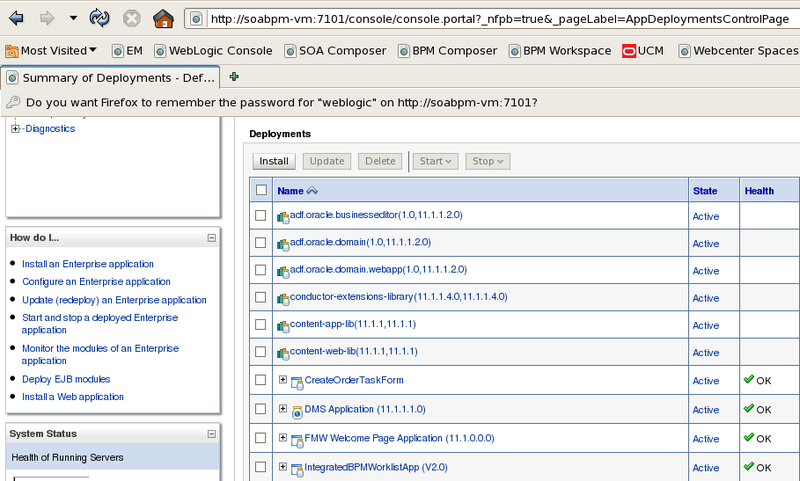 Earlier I was using jdev integrated weblogic as non soa which is 10.1.3.5 and stand alone soa of 10.1.3.6. 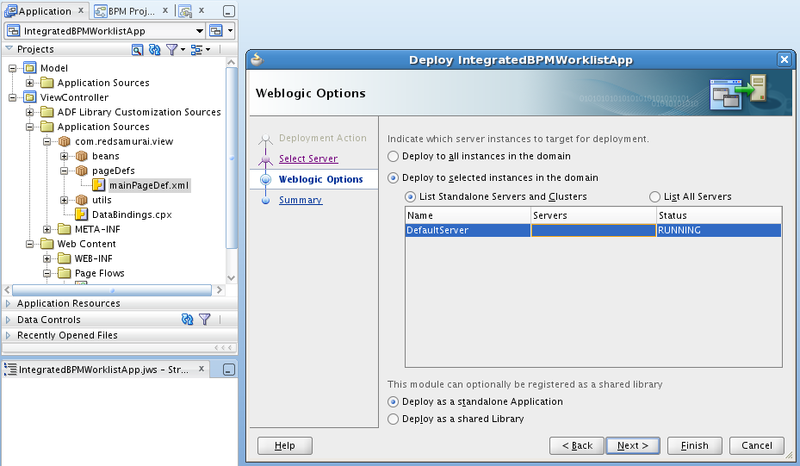 Now I installed different weblogic for non soa(10.1.36) and now it is working fine. 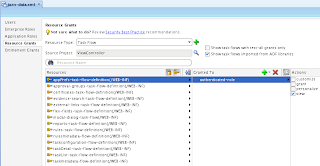 Now new problem is : I am trying to consume rulestaskflowdefinition task flow. If i deploy this to soa server there are no issues, but if i deploy to non soa server page comes up and if i click on any report on the left pane it is throwing below error. "Caused by: java.io.IOException: oracle.mds.exception.MDSException: MDS-00054: The file to be loaded oramds:/soa/configuration/default/workflow-identity-config.xml does not exist." Now this issue got resolved. 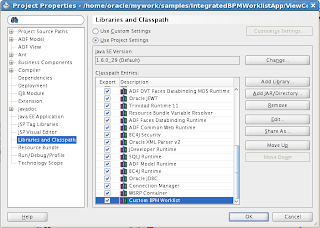 Oracle says this is a limitation in soa and they will be removing oramds from PS6. So in older versions we need to add mds-config to adf-config.xml of adf app to access workflow-identity-config.xml from non soa server. When I run reports task flow in non soa server page gets displayed and if i click on any report (on the left pane) it throws below error. "java.security.AccessControlException: access denied (oracle.security.jps.service.credstore.CredentialAccessPermission context=SYSTEM,mapName=BPM-CRYPTO,keyName=BPM-CRYPTO read)"
If you dont have these grants, let me know - I can send by email. I came across your post and was very useful. Testing the example code, I keep getting the message "ADF_FACES-30108:The view state of the page has expired because of inactivity. Reload the page." and the user has to authenticated again, again and again. 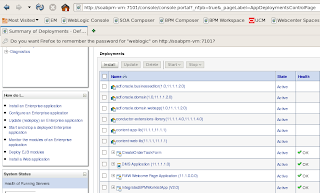 It was a configuration on weblogic.xml deployment descriptor. Please let others now what configuration specifically it was. 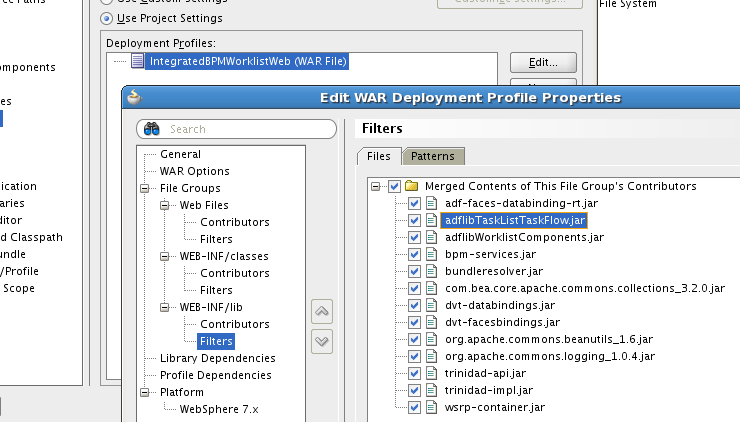 Another thing is that the "source" server of foreign JNDIs must have the same "Identity Provider" than your local development environment or else you should to use "wfCtxId" parameter from "taskList-task-flow-definition.xml" and make user authentication using through API to retrieve that token. The last resource is don't configure foreign JNDIs on your local development environment - you don't see the worklist but the rest of the application will work as expected. Thanks for sharing your findings ! 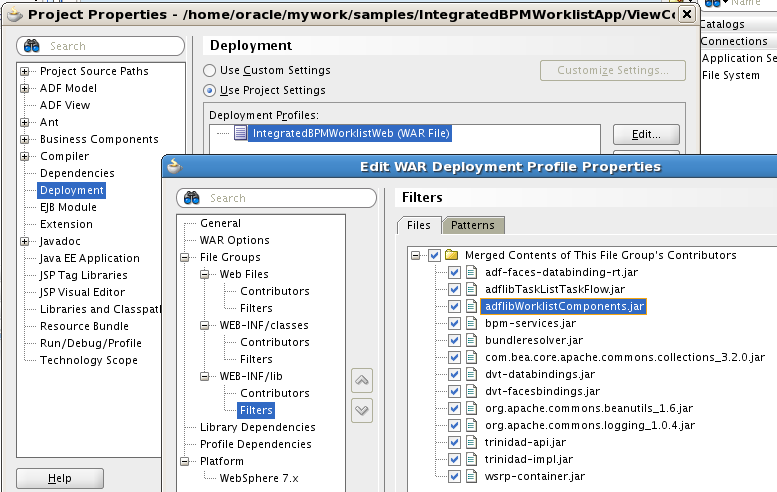 SOA server displayed an error: Default configuration is not defined in configuration "workflow-identity-cofig.xml. Hard to say... Looks like SOA server config issue. The problem is that I could not find the "work-flow-config.xml" file. Could you also make clear exactly which system-jaxz-data.xml needs the bpm-services security grants... the one on the non-soa domain or the one on the soa domain? 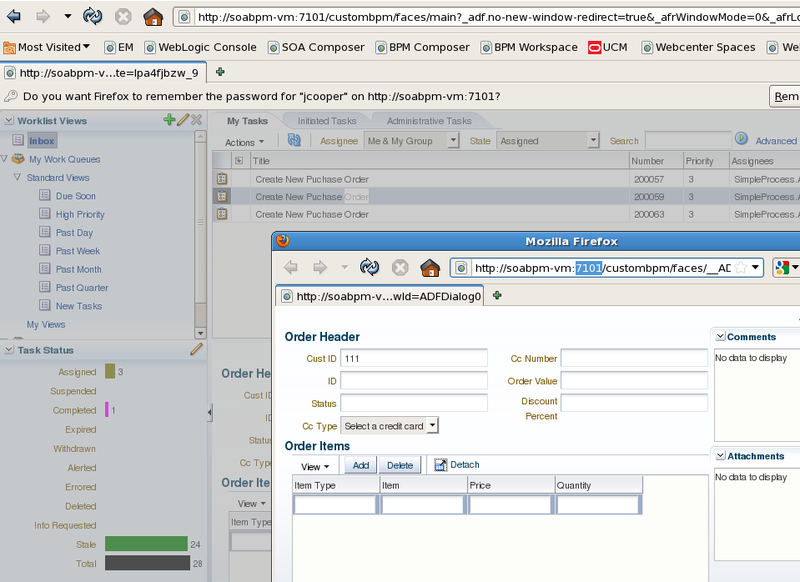 Your blog suggests change should be made on non-soa but oracle documentation seems to suggest on soa domain. Not clear! Access to internal workflow context is denied. Requested access to internal workflow context is not allowed according to security policy. Ensure that correct security policy is used. If the error persists, contact Oracle Support Services. I didn't had such error in my environment. 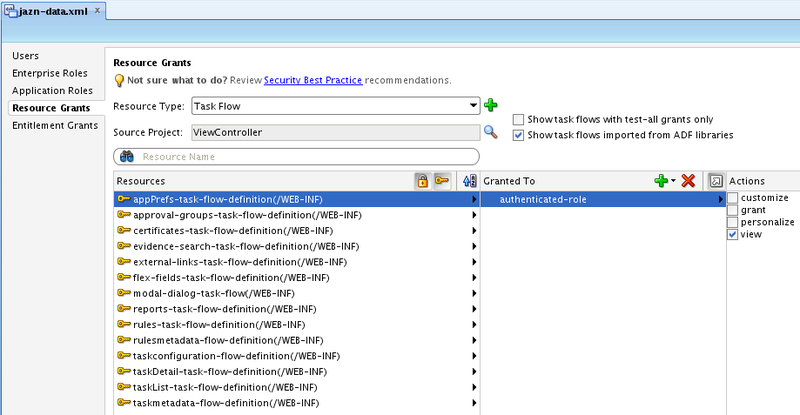 But you should check, may be Worklist task flow still works, even with this error. Finally got it working. Implemented this on an environment with multiple domains.. it was a little bit more complicated. Curious: Why an entirely separate domain? what is the benefit here over simply adding additional managed servers to the soa domain and even another machine or two to isolate the adf server JVM(s) to unique hardware if need be? Completely separate domains and MW_HOME binaries would allow for isolating patching concerns, but one might argue that these are fairly dedicated UI components sufficiently correlated functionally to preclude the need for separate maintenance/patch outages. Running separate domains is mainly for optimisation. Having ADF app on separate domain allows to restart domain quickier, BPM admin server requires more resources. From architecture point of view, is better to have them separate. Of course, technically it would work fine in one domain. That may allow the (adf) domain to start more quickly, but in the case of simply hosting human task UIs, what's the point? 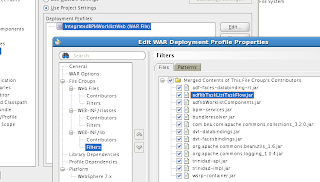 The ADF views are not usable without the process and the reverse is also true in this case. Given that dependency, the efficient architecture choice would be to deploy the ADF managed server VMs collocated in the SOA domain to reduce complexity on the premise that you have to wait for the SOA domain to start up to be useful anyway. Also, other than in DEV environments, restarting the domains is not a frequent activity outside of planned maintenance periods anyway. If you are going to host only ADF Human Task Flows, yes - it makes more sense to have one domain with separate managed servers. I agree with you. Great post as usual. 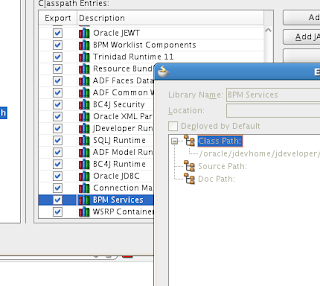 We successfully created custom BPM worklist client in ADF using BPM Java API. I see there is a confusion between foreign JNDI server vs wf_client_config.xml file among many developers. Would like to clarify on this. Foreign JNDI - When your ADF app wants to show tasks from only 1 BPM instance - go for this. wf_client_config - Lets say you have multiple BPM servers and you want to display tasks from all those servers, go for this configuration. Here you can specify multiple URLs. One more thing - go for REMOTE EJB. SOAP endpoint is meant to be used for internal purpose only (as per Oracle). Also, remember to set federatedMode = true.